Welcome to the international Sport Chutes watersports products and parasail equipment website. 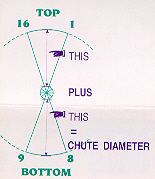 Sport Chutes has been serving the commercial and leisure watersports market with unique watersports products since 1983. 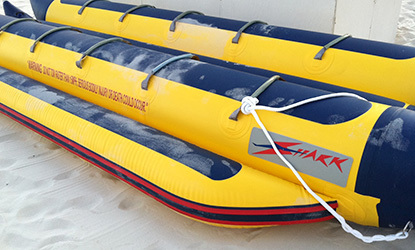 Sport Chutes manufactures every size of custom parasails, parasail equipment and parasail accessories as well as Shark inflatable watersleds in a variety of sizes. Sport Chutes is also the home of Paracraft USA where we manufacture the Warrior 32, the world’s best commercial parasail winchboat. 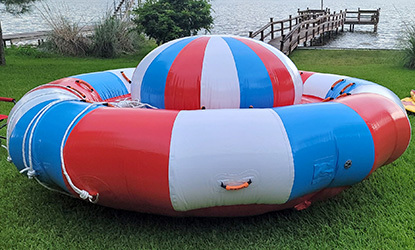 Whether you want to have fun over the water with our parasails, parasailing equipment or parasail accessories, or if you want to have fun on the water with our watersports products such as our Paracraft winchboats or inflatable watersleds or other water toys, you’ve come to the right place! 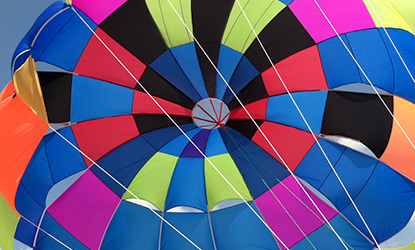 While Sport Chutes specializes in custom made parasails, made to your specs with logos or lettering for commercial purposes, we also serve the leisure market which just wants to have fun on the weekend. Besides the watersports market, Sport Chutes also offers custom sewing and specialty sewing through our ZipTight website. We offer innovative, cost effect, ergonomic (user friendly) sewed solutions to industrial problems or private goods or prototypes. 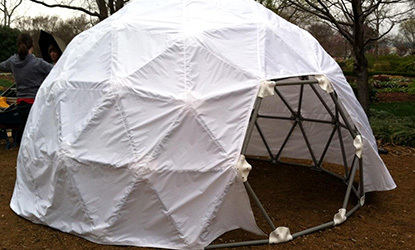 In addition, we manufacture flags, banners, locking product security covers for indoors or outdoors, mall kiosk security covers, retail merchandising unit (RMU) security covers and a vast array of other sewed or fabricated items. We offer custom sewed goods made of vinyl, nylon, vinyl coated nylon fabrics, or virtually any fabrics the customer specifies. We offer custom sewing to the industrial or commercial user who requires custom fabrication. Small orders of “one-offs” or production runs or prototypes are welcome for specialized quotes. Some of our prestigious clients include, The Academy Awards, Disney, Disney Cruise Lines, Spacex, St. Louis Cardinals, The Smithsonian Institution, The Smithsonian Air and Space Museum, The Washington Gallery, The Capitol Gallery, AT&T, Samsung, Godiva Chocolates, US Navy Research Labs, Johns Hopkins Medical University, and virtually every major shopping mall chain, etc. In fact, back in the 1980’s, we invented the lock-up, zip-up security covers you now see in all the mall aisles that protect the kiosks after hours. For more detail we invite you to visit our website www.ZipTight.com and look forward to serving you. Download our ZipTight brochure. Our website is intended to give you an overview of our offerings including watersport products and water toys. All of your products have been extensively tested over decades of use in the most vigorous commercial environments. This means, when you buy from Sport Chutes, you have years of our excellent reputation behind you. However, even with the information you find in this site, we realize it is impossible to thoroughly answer your every question, so we encourage your call. Our pledge to you is to offer additional instruction to assist in your learning about these sports. We will be glad to visit with you at length to completely answer your questions and provide guidance and recommendation in your selection. We are true experts in the business and would be delighted to earn your trust. We hope you enjoy our sports and please operate safely.